For the re-launch of MTV’s Total Request Live program, best known as TRL, Pete’ Big TVs was onsite providing a massive high-resolution, curved LED video wall, an LED floor, and a variety of smaller LED screens. 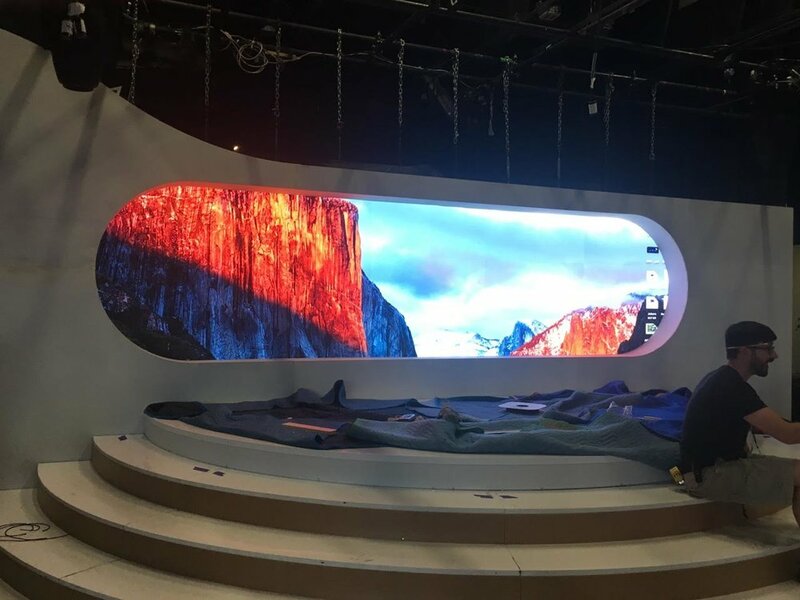 The high-resolution screens are part of the studio environment designed by Production Designer Dave Edwards for the NYC Times Square-based show. Edwards, Principal of the design firm, D Before E, Inc. was assisted by Art Directors Rebecca Lord-Surratt and Andy Broomell. 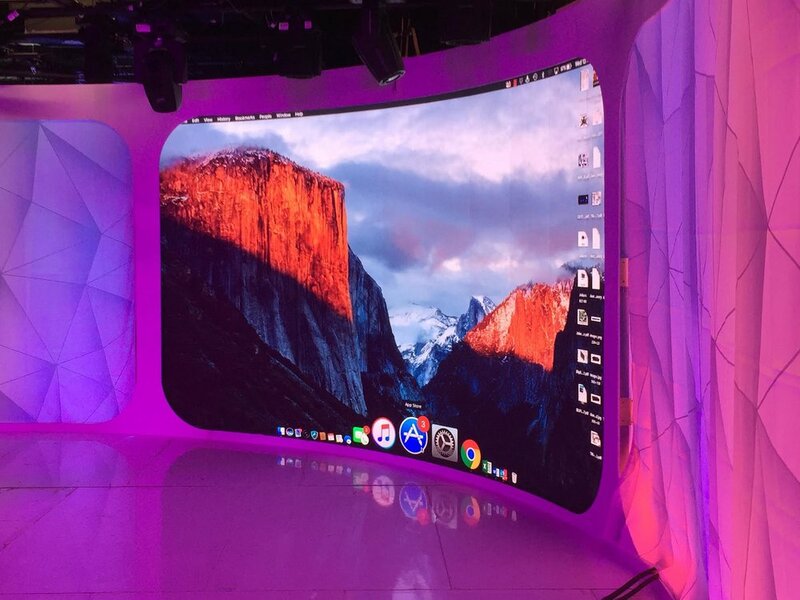 The main screen is an 11.5’ high by 26.35’ long curved screen consisted of Esdlumen’s Dazzle Plus 2.8mm LED video modules. The Esdlumen Dazzle Plus product is not designed for curves, so PBTV worked closely with the scenic team to build a curved structure to hold the modules. 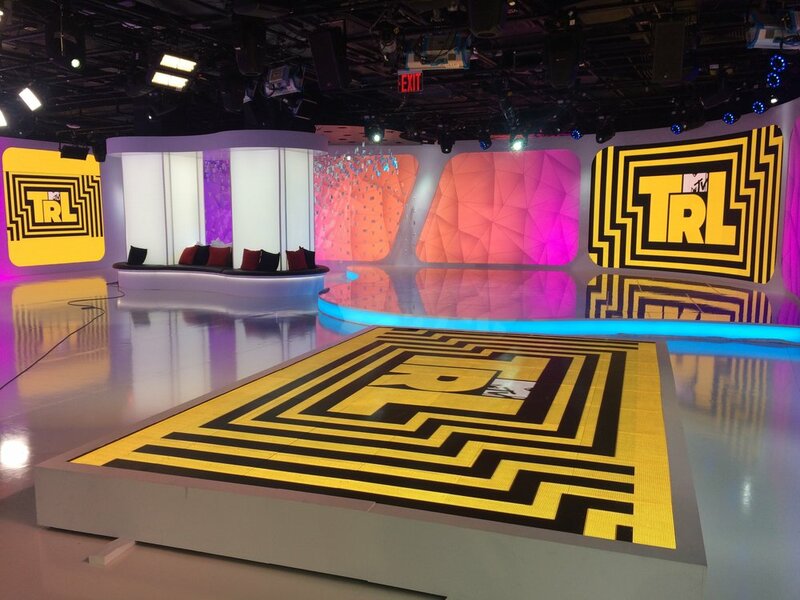 PBTV also supplied the TRL studio with a 9’ by 6’ LED floor consisting of 5.9mm LED modules. This LED floor worked as a stand-up position in the studio where creative video content can be fed from below to underscore an interview or performance. In addition, there are high-resolution LED screens scattered around the space that were made from digiLED’s iMAG-R 2.6mm LED video modules – one screen is 9.84’ by 9.84’; two screens are 4.9’ high by 9.84’ wide; and one screen that is 3.2’ high by 8.2’ wide. All LED processing for all of the video screens and LED floor was via NovaStar NovaPro HD processors. For the week of the launch, MTV is holding events outside the studio and PBTV has supplied a rolling cart with a rear video screen made up of digiLED DLPo5.9 LED modules. The exterior-rated 5.9mm LED panels, which can easily be rolled in and out as needed, are paired with PBTVs NovaStar NovaPro HD processing to highlight performances and presentations that MTV will have in support of the new TRL show. In addition to PBTV Vice President, Guy Benjamin being on site for this project, LED Technicians Matt Ellar and Louie Zelesnik were on hand during the installation and setup of the video walls and handled the integration of the control and processing.